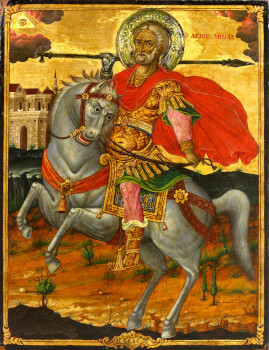 The Holy Great Martyr Menas, an Egyptian by birth, was a soldier and served in the city Kotuan under the centurion Firmilian during the reign of the emperors Diocletian and Maximian (284-305). When the co-emperors began the then fiercest persecution against Christians in history, the saint lost all desire to serve these persecutors and, having left the service, he withdrew to a mountain, where he asceticised in fasting and prayer. Once during the time of a pagan feastday he happened to arrive in the city, in which earlier he had served. At the climax of the festal games, which all the city had come out to see, rang out the accusing voice of the saint of God, preaching faith in Christ, the Saviour of the world. At trial before the governor Pyrrhos the saint bravely confessed his faith and said that he had come hither in order to denounce all of impiety. Saint Menas spurned he suggestion to offer sacrifice to the pagan gods, and he was put to cruel tortures, after which he as beheaded. This occurred in the year 304. The body of the holy martyr was ordered to be burnt. Christians by night gathered up from the burnt-out fire the undestroyed remains of the martyr, which later were installed in a church in his name, built after the cessation of the persecution, at the place of the suffering and death of the Great Martyr Menas.